at the corner of N.H. and V Sts. Embodying a ministry of radical, gracious welcome centered in vibrant, historic liturgy, we are an intercultural ELCA congregation that welcomes people of all sexual orientations and gender identities–racially integrated since 1954 and Reconciling in Christ (open and affirming of the LGBTQ community) since 1987. 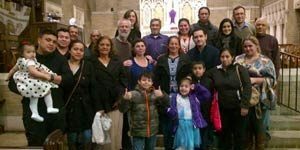 Our Spanish-speaking ministry, La Comunidad de Santa Maria, roots its mission of service, justice, and community in the living worship of Jesus our Savior. Santa Misa, Domingos a las 2:00 pm. Servicio de Sanidad, tercer domingo del mes. Escuela dominical durante la misa. 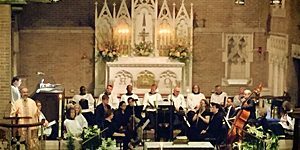 Worship with us, even when you are out of town, via our ALBUM media ministry. Our services are streamed live each Sunday via Facebook and YouTube at 10:30am. Stories of Christian Life from the people in the Pews. 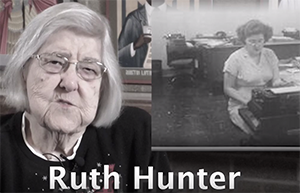 This first episode in the series features Ruth Hunter, a member of Augustana for over 50 years.